Are Your Neurotransmitters Ready For The Holidays? The holiday season is approaching. Have you given any consideration on how the holiday season affects your neurotransmitters? I’m guessing probably not. Read below and be armed and ready! Whether you celebrate Thanksgiving or not, most of us have experienced that sleepy feeling after eating too much turkey. Did you know that turkey is rich in tryptophan, a neurotransmitter precursor to melatonin, a neurotransmitter that helps you sleep!! Melatonin is derived from Serotonin, a well-recognized neurotransmitter responsible for a great part of our mood. Serotonin and Dopamine are probably the two most recognized neurotransmitters across the board. Little did you know but the things you do over this holiday season can have major impact on your neurotransmitters. But, there are positive lifestyle activities that can promote a healthy balance of neurotransmitters. Just as easy as our neurotransmitters may come out of balance, the trend towards balancing them can be achieved by the following five recommendations. Healthy Diet: Too many sweets over the holiday season disrupt the ideal fluctuations in brain chemistry and may deregulate our brain chemistry. Make sure to eat plenty of vegetables and take it easy on the sweet stuff. Manage your Stress: Stress raises free radicals, insulin, and blood pressure which all damage neurons. (3) If we damage our neurons, then we damage our neurotransmitters. Just Breathe: Sounds simple but breathing can have a major impact on our nervous system and its expression. The vagus nerve is the nerve that comes from the brain and controls the parasympathetic nervous system, which controls your relaxation response. (4) The more relaxed you are, then better response of neurotransmitters. Relax: It’s so easy to get caught up in the holiday madness that we forget to relax. Relaxation gives the brain time to rest, which in turn allows it to make the proper neurotransmitters. [Click to Tweet] So when you don’t feel like fighting the holiday madness, kick back and forget about it!! Neurotransmitters is an exciting or very boring topic depending on the audience. Regardless of your interest, it is important to keep up a healthy relationship with them. I tend to focus more on the eliminating the things that I know cause harm and focus on the things that I know cause balance in my neurotransmitter levels. 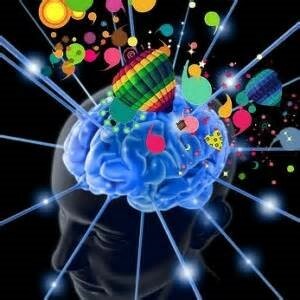 So when the holidays roll back around this year, keep in mind the above mentioned five factoids to create balance in your own brain chemistry. What is your biggest challenge at the holidays and how do you handle it? Did you know that the mammogram is not the only cool kid on the block? October is breast cancer awareness month. Virtually every person, entity, sport team, TV show, and advertising campaign participates. This is a good thing. It also seems like the perfect time to write an article about breast health and, more specifically, a screening tool of which you might not be aware. We all know someone who has had breast cancer. For me, it was my stepmother. It is scary because it is so common and attacks women (and men) of every age. It does not discriminate. In the near future, we will be posting an article about the functional medicine approach to breast health. In this article, though, I would like to let you know the facts about thermography. The FDA approved breast thermography as an adjunct diagnostic breast cancer screening procedure in 1982. Thermographers should be board-certified or provisionally certified clinical thermologists or technicians. Hopefully, this article will give you the basic information you need to discuss thermography as an option with your health-care provider. http://www.huffingtonpost.com/christiane-northrup/the-best-breast-test-the-_b_752503.html, citing H. Spitalier et al., “Does Infrared Thermography Truly Have a Role in Present-Day Breast Cancer Management?” in M. Gautherie and E. Albert, eds., Biomedical Thermology: Proceedings of an International Symposium (New York: A. R. Liss, 1982), pp. 269-78; R. Amalric et al., “Does Infrared Thermography Truly Have a Role in Present-Day Breast Cancer Management?” Progress in Clinical and Biological Research, vol. 107 (1982), pp. 269-78. 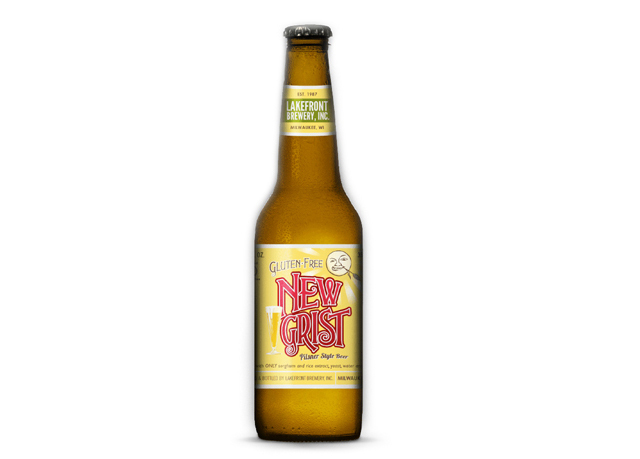 Fall, Football and Gluten Free Beer? 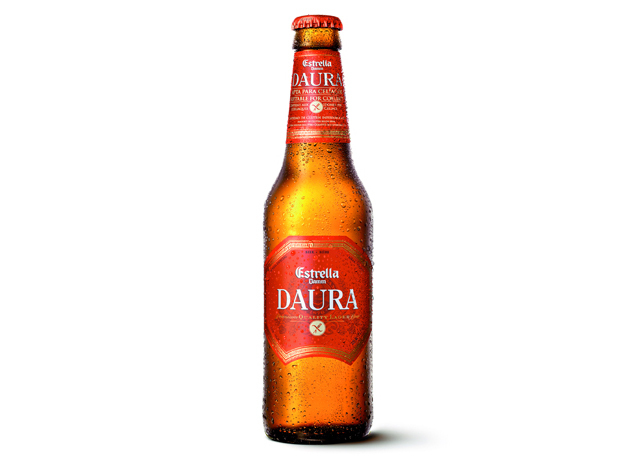 Is There Really a Gluten Free Beer that Tastes Like Beer? Yes! It’s that time of year – football season! Here some ideas about how to cheer on your team if you have a gluten allergy or sensitivity. By now everyone who has read my blogs knows that I am a HUGE Ohio State Buckeye fan. 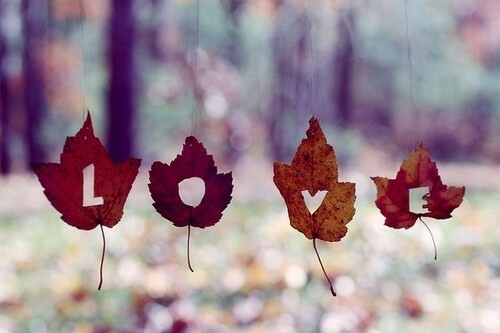 As such, Fall, which has always been my favorite season, is even better. In my book, the perfect way to spend a Saturday afternoon in the Fall is in front of the TV (preferably outside) with a cold beer and other crazy fans, watching my Buckeyes take the field. When I was diagnosed with a gluten sensitivity a few years back, I thought my Saturdays would never be exactly the same again. I was wrong. 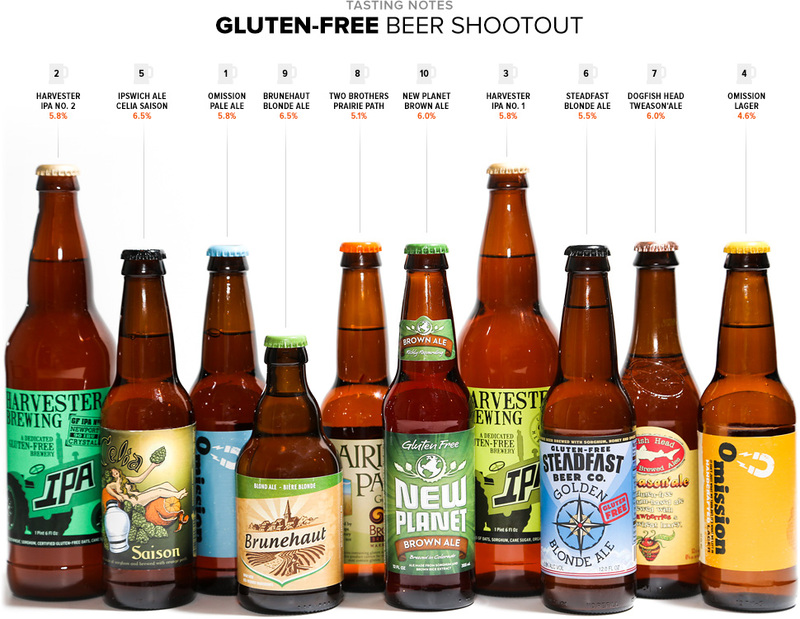 There are gluten-free beers that taste like beer and many of them are found at your local sports bar. Here are a few that I like that are readily available. Redbridge. 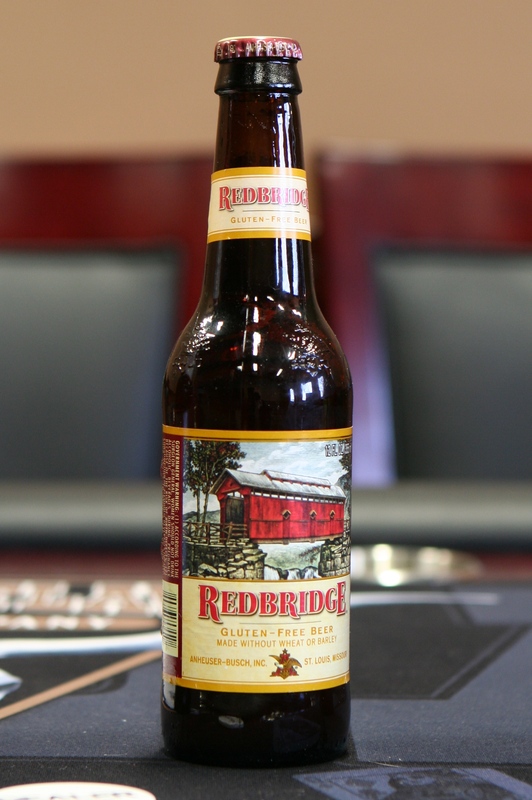 Budweiser makes this beer and, a such, it is in almost every sports bar. 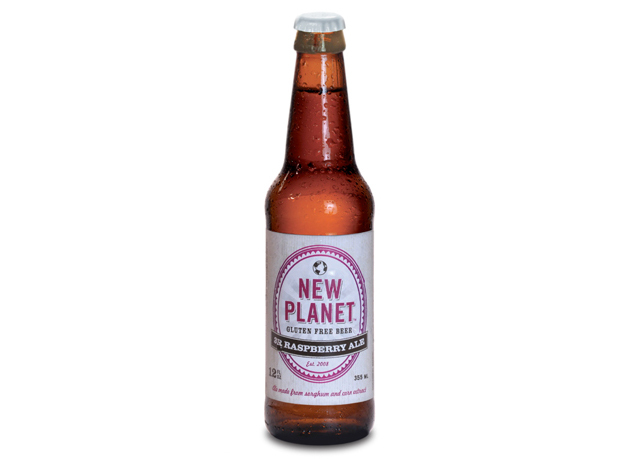 It tastes like a Budweiser – go figure! And my favorite (drum roll please) . 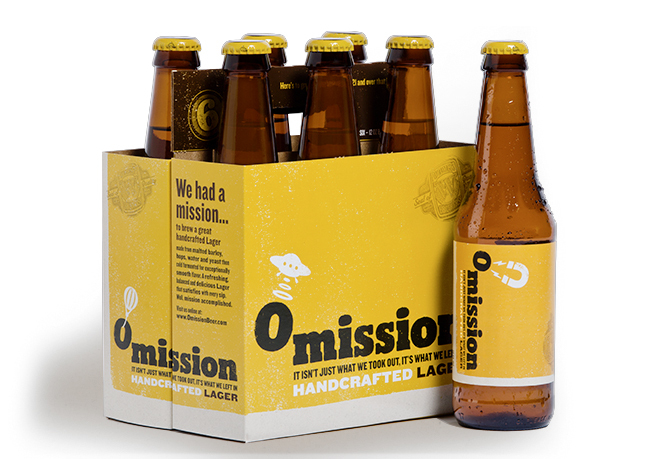 . . Comes in 3 great brews: lager, pale ale and an IPA. Check them out and Go Bucks! 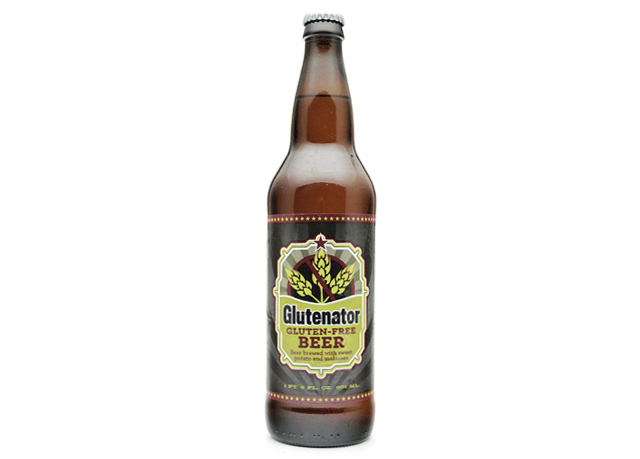 Do you have a gluten-free beer that you love? Do You Really Need to Soak Your Nuts? Yes! What’s The Deal With Soaking Your Nuts? Phytic Acid – That’s What! Unless you suffer from a nut or seed allergy most of us have enjoyed the crunchy sensation when biting into our favorite nuts or seeds. What you might not have known until reading this blog is that you need to take an extra step before biting into those delicious snacks to optimize the nutritional potential they hold. And you might ask what is that step! That’s right soaking your nuts. I must admit I do not always soak my nuts but each day strive to make healthier decisions for me and my family and you can often find soaked nuts in my refrigerator as a healthy snack. I was first exposed to so many things in Chiropractic school and soaking my nuts and seeds was one of those memorable experiences. I remember a long bus ride to Texas with a bunch of my rugby mates to play a match and one of the Australians passing a bag of seasoned and soaked almonds. The consistency was so different in anything I had ever tried that it will be one of those things that I may remember forever. If you have never tried soaking your nuts and seeds, then you should try it!! How else are you going to stimulate new neurons in the brain if you do not try something new? You’ll notice that soaked walnuts do not have that astringent, mouth-puckering taste to them. This is because when soaking walnuts, the tannins rinse away, leaving behind a softer, more buttery nut. The soak water from nuts and seeds should always be discarded and never used as water in a recipe. The website Whole Lifestyle Nutrition asks the question, “Is it necessary to soak your nuts?” The answer is “absolutely” they go on to explain. Nuts have phytic acid. Phytic acid is also found in grains and legumes. 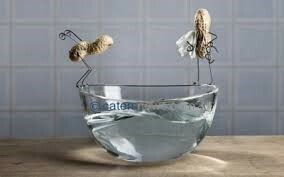 Just as with grains and legumes, soaking nuts is essential for proper digestions. When eating nuts that haven’t been soaked, the phytic acid binds to minerals in the gastrointestinal tract and cannot be absorbed in the intestine. [Click to Tweet] To many, bound minerals can lead to mineral deficiencies. By soaking, you are breaking down the phytic acid so it is absorbed properly. Nuts also have high amounts of enzymes inhibitors. This is another reason why un-soaked nuts are hard to digest. Soaking nuts neutralizes the enzymes allowing for proper digestion. As a functional medicine doctor, I often discuss nuts with my patients in relation to digestive health. I have heard many explanations of why not to eat nuts and seeds that state they are bad for the gut. None of the arguments have convinced me at this point. I will recommend those who come into the office with gastrointestinal inflammation, that soaking their nuts is a piece in the puzzle that helps allow their digestive system to recover to optimal function. I might even have some people avoid nuts completely for a period as I have seen gastrointestinal markers improve when people do avoid nuts temporarily. The Paleo Mom has a great article on her investigation into the topic of nuts and why they are or are not good for your gut. She says “the science is lacking,” which I agree and will continue to investigate further as the subject is addressed further. Hopefully at this point, the idea of soaking your nuts not only makes you think differently about the foods you are eating but also may inspire you to try new ideas with nuts such as making your own nut milk. I recently tried making almond milk and what a hit!! So next time you’re munching on some crunchy nuts, save some and soak a handful if you’ve never tried it! Are You Thinking Above the Line? 7 Easy Steps to Start. Our clinic, as a team, went to a few seminars to help us focus on positive thinking. Surrounding our patients with an atmosphere that is both healing and positive is one of our missions. One of the biggest takeaways was the power of positive thinking. Positive thinking is part of the above-the-line model. Above the line thinking involves having an optimistic outlook. The opposite would be “below the line” thinking. These types of thinkers have a limited view on the world. I am going to share some tips and tricks I have learned through my experience and attendance at these seminars. Treat others how you would want them to treat you, your child, your elderly grandma, etc. 3. 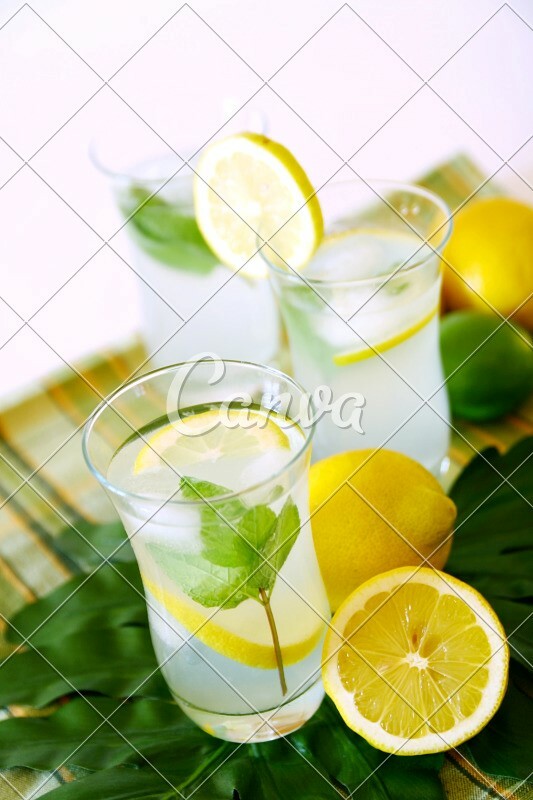 Lemons make tasty lemonade! Make the best of every situation. Maintain an optimistic outlook especially through the hard times. Talk about it; you are not alone. Find someone who can relate to your situation and talk it out. If you say it, Do it! If you want to be somewhere or accomplish something, start working towards your goals. After all, no one is stopping you, but you. Get past your fears and anxiety and try something new. Always follow the 80/20 rule when it comes to listening to other, no matter with whom you are conversing. 6. Improvise, Adapt, Overcome. (I know this is the unofficial slogan for the U.S. Marines but it is great advice). Allow life to happen, do not limit your experiences. 7. Have a mission and purpose in life. Don’t wander aimlessly through life. Set achievable and realistic goals for yourself. Congratulate or reward your success. Prioritize your day, week, month, and year(s). Trust your instincts; believe in yourself without fail! We are human and creatures of habit. However, we have the power to turn our habits into ones that embrace positive thinking and an optimistic attitude towards life and others. (Click to Tweet). We can think above the line! 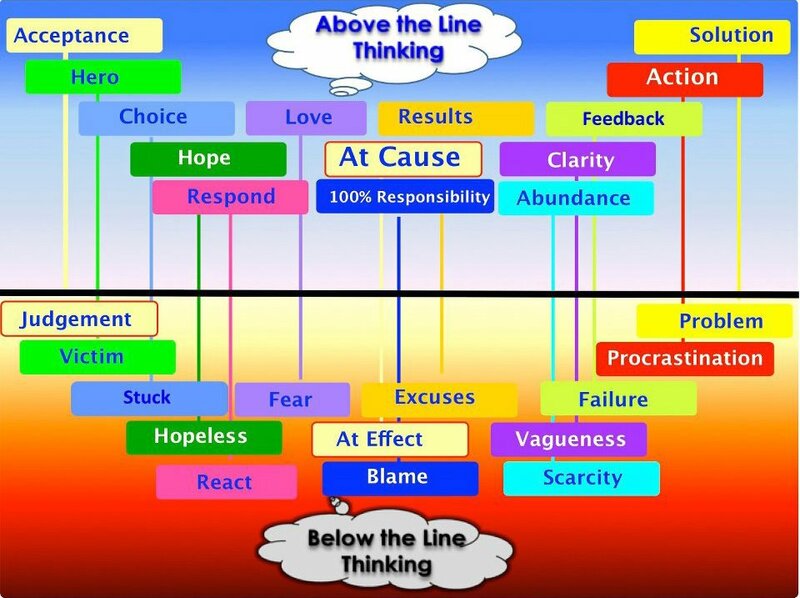 Click here for a great blog and chart to help remind you every day of how to think above the line. Can you identify any below the line thinking in your life? How can you apply above the line thinking techniques to help you live happier and healthier?